C-124 from the 22nd MAS at Tachikawa on one of the few actual combat airlift missions C-124s and MAC crews ever flew. This airplane brought an Army Caterpillar into the remote camp at Kham Duc on May 10, 1968. Two days later the camp was evacuated by C-130s, one C-123 and Army and Marine helicopters. Two C-130s were shot down during the evacuation. If there is an airplane that old MATS crewmembers look back on with fondness, it is undoubtedly the Douglas C-124 Globemaster II. For a generation of airlifters, the C-124 personified airlift, and those who flew the shakey old bird, often known as "the aluminum overcast," treasure the memories of those years. Until the advent of the C-5, the C-124 was the only airplane capable of carrying some of the Army's largest items of cargo. And, thanks to TAC, it was the only MATS airplane other than the C-130E that was capable of airdrop before the C-141 entered service. The C-124 is a direct descendant of the C-74, a design that was developed during the first months of World War II. A contract was let for 14 C-74s in 1942, but it was not until September, 1945 that the first airplane flew. The contract for a subsequent order was cancelled and the money diverted for the C-124, which was built off of the C-74 airframe. Both airplanes featured the same wings and, at least initally, the same engines. The C-124 had a much larger fuselage, which allowed it to accomodate items that were previously too large for airlift. The development of the C-124 came at a time when the Troop Carrier Command was looking for a long-range transport with tactical capabilities. The Air Transport Command, which had just become Military Air Transport Service, felt that all of the C-124s should be assigned to it's squadrons and a big political row ensued over the airplane. In the end, TAC prevailed and tactical capabilities were added to the C-124 even though it was not the airplane TAC really wanted. Ironically, it was neither MATS nor TAC who got the first C-124s, but rather SAC, who assigned the huge transport to its logistical support squadrons. Subsequent deliveries went to TAC and MAC and the airplane was just coming into service when the Korean War broke out. Initially, the C-124s were used on the long overwater flights to the Far East from the West Coast. The TAC squadrons flew missions for MATS, which was severly under-strength in terms of airplanes and personnel. TAC C-54s also operated with MATS. In September, 1951, the Air Proving Ground C-124 went to Korea for testing with the 315th Air Division. A single C-124 could do the work of a pair of C-54s, and the 315th commander asked that a squadron be assigned to his command. In the fall of 1952 C-124s were assigned to two squadrons of the 374th Troop Carrier Wing in Japan and were heavily involved in the Korean Airlift. In the end, the last active duty C-124s would be assigned to PACAF. While MATS used the C-124 as an overwater transport, TAC used it as a troop carrier. SAC used the airplane to support the nuclear-carrying B-36 force. In the Far East, 315th Air Division used it primarly to carry outsize cargo that was too large for the C-119s with which its squadrons had equipped during the Korean War. C-124s were used in Indo China, particularly to airlift the wounded from the Dien Bien Phu battle back to France. Air evac C-124s assigned to 315th picked the patients up in Indochina and flew them to Japan. There they were loaded onto TAC airplanes for the flight to France. In the late 1950s, as TAC was starting to get C-130s, the troop carrier C-124 squadrons transferred to MATS. For the TAC flight crews, the transfer was a big change as they went from troop carrier flying to cargo missions with MATS. MATS crews wore Class A uniforms when they flew, while the TAC crews wore flying fatigues. Though now part of MATS, the former TAC units retained their troop carrier idenity while the MATS units were designated as air transport squadrons. By the early sixties, all of the C-124s were either in MATS, or assigned to the logistical support squadrons which had become part of the Air Force Logistics Command. MATS airplanes were based at Charleston, SC, Savannah, Georgia, Dover, Delaware, Suison, California and Tacoma,Washington. The 6th and 22nd Troop Carrier Squadrons, based at Honolulu and Tachikawa, Japan, respectively, were assigned to MATS but operated under the control of PACAF. With the advent of the TAC Composite Air Strike Force concept in the late 1950s, MATS' C-124s undertook a new role as they became responsible for assisting TAC's C-130s during deployments of TAC fight units overseas. In the early sixties the Air Force ordered the C-124 squadrons to attain tactical profficiency, and C-124 crews were soon heavily involved in airdrop training at Pope and Fort Campbell. As events in Southeast Asia led to an increase in the American presence there, the C-124s were soon heavily involved in airlift opertions carrying cargo from the United States and Hawaii to Vietnam and Thailand. MATS C-124s were also involved in the Congo. A C-124 crew from Charleston was pulled from their airplane and savagely beaten by a hostile mob at Stanleyville. For C-124 crews, a flight to the other side of the world took more than two weeks to complete. Ole Shakey could carry a sizeable load, but the airplane was slow and unpressurized, which meant the crews had to operate below 12,000 feet and down in the weather. A mission was rather demanding physically on the crews. The 22nd TCS at Tachikawa operated under 315th Air Division to carry outsize cargo. While MATS C-124s operated only into the coastal bases where there were MATS facilities, the 22nd crews often delivered large generators and other items too large for C-130 lift into airfields in the interior of Vietnam. Tachikawa-based C-124s were a regular sight at many of the forward airfields in South Vietnam, as the big airplanes were used in the tactical airlift role. 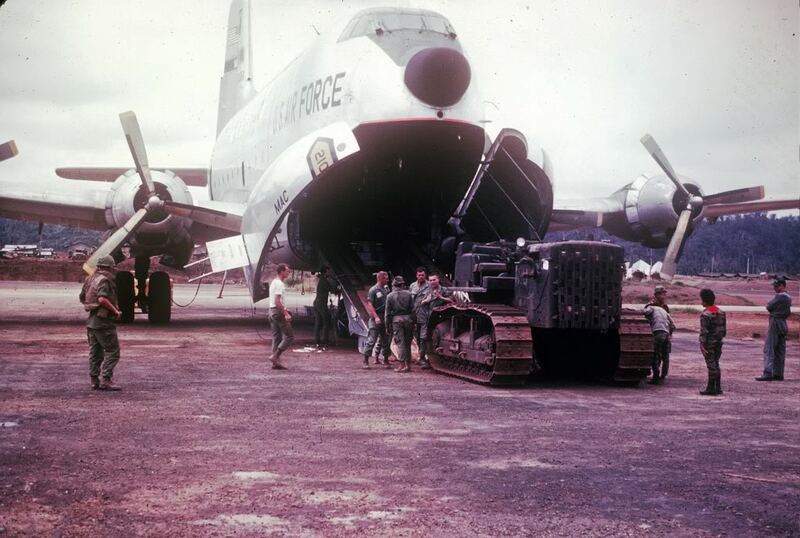 Two C-124 missions were flown into Kham Duc carrying bulldozers and US Army engineers as the camp was reinforced prior to the dramatic evacuation on May 12, 1968. MATS C-124s flew literally all over the world, but they were limited to hard surface runways which kept them from attaining the reputation of the more rugged C-130s. Because they were unpressurized, the C-124s were used almost exclusively for cargo transport by MATS, with the jet C-135s assuming the troop and passenger carrying role. One C-124 mission was airdropping supplies to Operation Deep Freeze outposts in Antarctica. The C-124 crews flew out of Christ Church, New Zealand, for the drops. In 1964 the C-141 made its appearance, and signalled that the days of the C-124 were indeed numbered. But the C-124's huge fuselage allowed it to carry items of cargo too large for delivery by C-141, so a few squadrons remained on active duty until almost the end of the decade. The only other airplane with outsized cargo capabilities was the C-133, but that airplane was plagued with problems and most were retired from service by the late 1960s. Charleston, Dover, Travis and McChord each retained a C-124 squadron as the others on the bases received the new jet C-141. The AFLC logistic squadrons also retained their C-124s for a time. On New Years Day, 1966, MATS became MAC and all of the squadrons became military airlift squadrons. The 22nd in Japan continued under 315th Air Division control even though the squadron became part of MAC. The AFLC logistics squadrons also transferred to MAC, and the 7th Log at Robins AFB, GA became the 58th MAS and began equipping with C-141s. The squadron at Kelly retained its C-124s for a time, while the Hill AFB, Utah unit was inactivated. As the MATS C-124s were replaced by C-141s, the Globemasters transferred to reserve and air guard squadrons. The reserve units began flying overseas missions, and thus continued to offer the outsize cargo capabilities for which the C-124 was famous. In 1968 MAC deactivated the 22nd at Tachikawa, and the designation moved to Travis. To replace the 22nd C-124s, the Air Force assigned four of them to the 463rd Tactical Airlift Wing at Clark, where they became part of the 20th Operations Squadron along with some C-118s that were used for Air Evac. The 20th OS C-124s continued to fly outsize cargo missions into Southeast Asia as the 22nd MAS had done. In the summer of 1970 MAC took delivery on the first of its C-5s, and the larger Galaxy picked up the outsize cargo mission. In the early 1970s the Air Force began replacing the C-124s in the reserve units with C-130s. The aging C-124s made their last flight to the boneyard, or to aviation museums where they remain as a testimonial to a by-gone era.